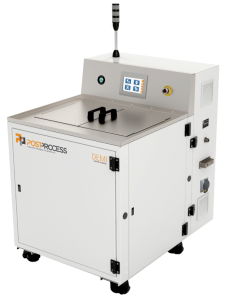 The patent-pending BASE offers the largest envelope in PostProcess’ Support Removal series of machines and delivers uniform, high-quality results for every part, regardless of geometry, with short cycle times to meet high-volume production needs. The BASE removes supports from the following 3D printing technologies: FDM, SLA, PolyJet, CLIP, and more. The BASE provides delicate to robust support removal with higher throughput using Volumetric Velocity Dispersion (VVD) technology to ensure complete part coverage. The system is ruggedly designed for the largest additive manufactured parts, with an envelope measuring 53″ L x 30″ W x 32″ H.
PostProcess’ proprietary Volume Velocity Dispersion (VVD) technology, a series of high volume and flow jet streams spraying bidirectionally coupled with perpendicular linear motion for mechanically assisted support removal, ensures fast cycle times with virtually no damaged parts. Because of the high-volume (200 GPM), low-pressure system (35 PSI), parts feel a powerful yet gentle, all-encompassing flow of detergent that also keeps the part in place. Once applied, the constant force felt by the part reduces the risk of damaging parts. One result of the bi-directional jetting action is the part remains stationary and avoids any potential collisions that a circulation tank may subject parts to damage. By combining PostProcess’ proprietary AUTOMAT3D™ software program with precisely controlled energy and exclusive eco-friendly detergents, the BASE delivers consistent, hands-free support removal for 3D printed parts. Our solution accelerates your operations with features like intelligent cycle time programming, customizable settings, one-touch repeatability with recipe storage, and pre-programmed preventative maintenance schedules. PostProcess thought of all the ways to make your post-printing more efficient – built-in rinse capability to ensure detergent and residue are eliminated after the supports have been removed, a counter-weighted vertical sliding door, and a viewing window into the LED lighted chamber. Utilizing noise reducing features for a low dBa, the BASE All Process ensures minimal additional noise is added to your production floor environment. 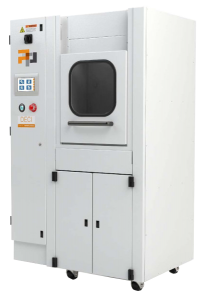 The DECI offers a large work envelope and delivers uniform, high-quality results for every part, regardless of geometry, with short cycle times to meet your high-volume production needs. The DECI provides delicate to robust support removal with higher throughput using unique Volumetric Velocity Dispersion (VVD) technology to ensure complete part coverage and removes supports from the following 3D printing technologies: FDM, SLA, CLIP, and more. VVD software-driven technology uses a series of high volume and flow jet streams spraying bidirectionally, coupled with a perpendicular linear motion for mechanically assisted support removal. No other system in the world combines hardware tailored for 3D post-printing with custom software and eco-friendly consumables. With PostProcess’ proprietary Agitation Algorithms ensuring precision controlled energy and controlling the flow of eco-friendly detergents, the DECI delivers consistent hands-free support removal from 3D printed parts. The DECI comes with a built-in rinse capability to ensure detergent and residue are eliminated after supports have been removed and a viewing window into the LED lighted chamber. PostProcess designed thoughtful features into the system like a counter-weighted vertical sliding door, casters for easy installation, and noise-reducing features for a low dBa to ensure minimal additional noise is added to the production floor environment. 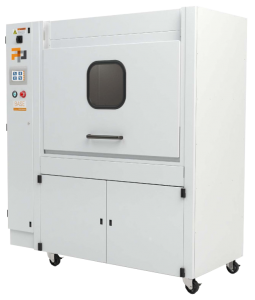 The CENTI Support Removal Production Series solution provides all the conveniences of a compact bench-top footprint, with an envelope sized for a few large or several small geometries. Rely on the patent-pending CENTI for superior support removal for all 3D printed materials. The CENTI removes supports from the following 3D printing technologies: FDM, SLA, PolyJet, CLIP, and more. Utilizing PostProcess’ proprietary software, the CENTI combines multiple forms of customized agitation and optimized energy. Paired with exclusive detergents, the right amount of time, and exact temperature based on the material and geometry of the 3D printed part, the CENTI delivers precise, hands-free support removal from 3D printed parts. All of PostProcess’ production Support Removal machines, including the CENTI, have noise reducing features for a low dBa (“library quiet” as we like to call it) and reduced heat cycle. 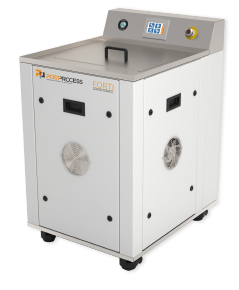 The FORTI includes PostProcess’ patent-pending Submersed Vortex Cavitation (SVC) technology – the system uses a rotating motion while the part is immersed in fluid and ensures even exposure to the induced mechanical agitation. Utilizing proprietary software and paired with exclusive detergents, the right amount of time, and exact temperature based on the material and geometry of the 3D printed part, the FORTI delivers precise, hands-free support removal for additive manufacturing workflows. When throughput is essential, the DEMI Process automated submersion system is engineered to meet the demands of volume production while ensuring consistency of every part. The varying specifications of the four models ensure a range of features are available for your support removal needs. All four models incorporate proprietary software program and eco-friendly detergents for a complete additive manufacturing post-print solution. The patent-pending DEMI removes supports from the following 3D printing technologies: FDM, SLA, CLIP, PolyJet, and more. PostProcess integrates multiple technologies into one intelligent, advanced design. Agitated flow is utilized to effectively remove supports and is done with a ‘sink-float’ process to rotate parts throughout the chamber. This variable motion, combined with optimal energy delivery and detergent filtration, results in fast and uniform support removal. With the motion of fluids within the machine controlled by PostProcess’ Agitation Algorithms, sensor data adjusts in real-time so that parts are not damaged and removal of supports is consistent.